Due to the energy storage property of PEV batteries, they could be considered as an energy storage system (ESS) to minimize the total costs of the power systems during coordination interval, and potentially smooth out the fluctuation of the intermittent renewable energy source (RES) and the power load profile as well. 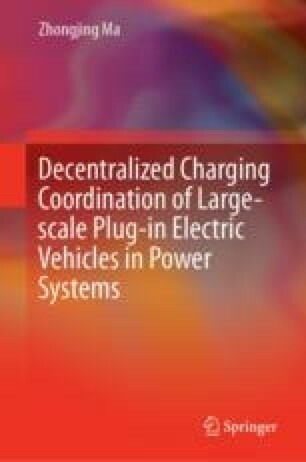 In this chapter, it firstly formulates a class of charging and discharging coordination problems of PEVs which deals with the tradeoff between total electricity cost and the accumulated battery degradation costs. It shows that the optimal solution possesses the valley-filling & peak-shift property for any pair of adjacent instants, and then proposes a coordination method by applying the gradient projection method. Due to the decoupling relationship among the admissible sets of coordination behaviors of all the PEVs in the modeling issue, a decentralized algorithm is proposed by applying the gradient projection method, such that the coordination behaviors of individual PEVs can be updated locally and simultaneously. It is proved that, the convergence and optimality of the proposed method are guaranteed in case the step-size parameter of the update procedure is in a certain region, and its performance doesn’t rely on the shape of the base demand trajectory. Furthermore, a receding horizon based algorithm is presented to account for the forecast errors occurred in the predictions of PEV populations, RES productions and inelastic load profiles. The results developed in this chapter are demonstrated with numerical simulations and comparisons with other decentralized methods are also provided.